Ringolevio is a classic American story of self-invention by one of the more mysterious and alluring figures to emerge in the 1960s. Emmett Grogan grew up on New York City’s mean streets, getting hooked on heroin before he was in his teens, kicking the habit and winning a scholarship to a swanky Manhattan private school, pursuing a highly profitable sideline as a Park Avenue burglar, then skipping town to enjoy the dolce vita in Italy. It’s a hard-boiled, sometimes hard-to-believe, wildly entertaining tale that takes a totally unexpected turn when Grogan washes up in sixties San Francisco and becomes a leader of the anarchist group known as the Diggers. The Diggers, devoted to street theater, direct action, and distributing free food, were in the thick of the legendary Summer of Love, and soon Grogan is struggling with the naive narcissism of the hippies, the marketing of revolution as a brand, dogmatic radicals, and false prophets like tripster Timothy Leary. Above all, however, he struggles with himself. 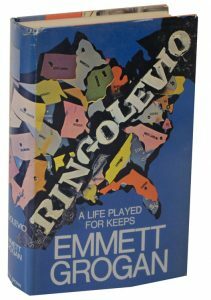 Ringolevio is an enigmatic portrait of a man and his times to set beside Hunter S. Thompson’s stories of fear and loathing, Norman Mailer’s The Armies of the Night, or the recent Chronicles of Bob Dylan, who dedicated his 1978 album Street Legal to the memory of Emmett Grogan.